Kuppalli is a small village in teerthahalli taluk, Shimoga District. It is the birthplace and childhood home of the renowned Kannada playwright and poet Kuvempu. 'Ku'-Kuppalli, 'Ven'-Venkatappa, 'Pu'-Puttappa. We Had been to Teerthahalli for the occassion of Shruthi's marriage on feb 11th 2009. After the marriage, we, a big group of 14 went to Kuppalli which is around 16 km from Teerthahalli in Teerthahalli-Koppa road. 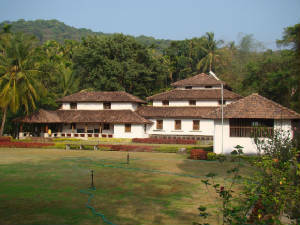 Kuppalli is a typical Malnad village with lots of silence all around.The childhood home of Kuvempu at Kuppali has been converted into a museum by Rashtrakavi Kuvempu Pratishtana (a trust dedicated to Kuvempu. You can get books written by Kuvempu. 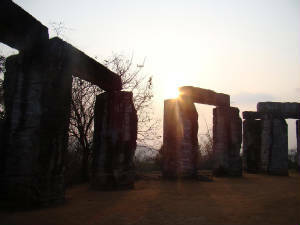 Kavishaila is a rock monument made of megalithic rocks and dedicated to Kuvempu. The place in the midst of greenery is simply superb. Near this monument, is a small rock where Kuvempu used to sit and write. went by : Train till shimoga and by bus till Kuppalli.